The titular church of St. Anastasia, once the Court church during the Byzantine period, is chosen for today’s station instead of the Basilica of St. Paul, as the latter is too far out for a procession at this season of the year when the weather is too warm. During the Octave of Pentecost the Church celebrates more especially the glories of the grace of the Holy Ghost and His secret work of sanctification in the Mystical Body of Christ. Thus to-day she repeats in the verse for the Communion the words of Our Lord: “The Spirit Who proceedeth from the Father, He shall glorify Me,” and this glorification consists chiefly in our sanctification and in the growth of the Kingdom of God in our souls. Once we become convinced through understanding of the truths of the Faith, we can also draw conclusions from those truths and arrive at a further understanding of man’s relation to God and his role in the world. Understanding rises above natural reason, which is concerned only with the things we can sense in the world around us. Thus, understanding is both speculative—concerned with intellectual knowledge—and practical, because it can help us to order the actions of our lives toward our final end, which is God. Through understanding, we see the world and our life within it in the larger context of the eternal law and the relation of our souls to God. Let the power of the Holy Spirit be present with us, O Lord, both graciously cleansing our hearts and guarding us from all dangers. Through our Lord Jesus Christ, Thy Son, Who livest and reignest with Thee in the unity of the Holy Ghost, one God Forever and ever. R.Amen. Lesson from the Acts of the Apostles. In those days, when the apostles that were in Jerusalem had heard that Samaria had received the word of God, they sent unto them Peter and John; who, when they were come, prayed for them, that they might receive the Holy Ghost: for He was not as yet come upon any of them; but they were only baptized in the name of the Lord Jesus. Then they laid their hands upon them, and they received the Holy Ghost. Alleluia, alleluia. V. (John 14: 26) The Holy Ghost shall teach you whatsoever I shall have said to you. Alleluia. Here all kneel V. Come, O Holy Spirit, fill the hearts of Thy faithful: and kindle in them the fire of Thy love. And from Thy celestial home Shed a ray of light divine. Give them joys that never end. Amen. Alleluia. At that time, Jesus said to the Pharisees: “At that time, Jesus said to the pharisees, Amen, amen, I say to you, he that entereth not by the door into the sheepfold, but climbeth up another way, the same is a thief and a robber. But he that entereth in by the door is the shepherd of the sheep. 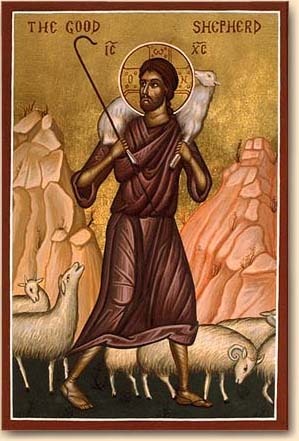 To him the porter openeth, and the sheep hear his voice, and he calleth his own sheep by name, and leadeth them out. And when he hath let out his own sheep, he goeth before them; and the sheep follow him, because they know his voice; but a stranger they follow not, but fly from him, because they know not the voice of strangers.” This proverb Jesus spoke to them: but they understood not what He spoke to them. Jesus therefore said to them again: “Amen, amen, I say to you, I am the Door of the sheep. All others, as many as have come, are thieves and robbers; and the sheep hear them not. I am the Door. By Me if any man enter in, he shall be saved; and he shall go in, and go out, and shall find pastures. The thief cometh not but to steal, and to kill, and to destroy. I am come that they may have life, and may have it more abundantly. The Lord opened the doors of Heaven, and rained down manna upon them to eat: He gave them the bread of Heaven, man did eat the bread of angels, alleluia. May the offering of the gift here before Thee, we beseech Thee, O Lord, purify us and render us worthy of its sacred participation. Through our Lord Jesus Christ, Thy Son, Who liveth and reigneth with Thee in the unity of the Holy Ghost, one God Forever and ever. We therefore beseech Thee, O Lord, graciously to accept this oblation of our service, as also of Thy whole family, which we make unto Thee on behalf of these whom Thou hast vouchsafed to bring to a new birth by water and the Holy Ghost, granting them remission of all their sins: and to dispose our days in Thy peace, preserve us from eternal damnation and rank us in the number of Thine Elect. Through Christ our Lord. Amen. COMMUNION ANTIPHON John 15, 26; 16, 14; 17, 1, 5P. The Spirit Who proceedeth from the Father, alleluia. He shall glorify Me, alleluia, alleluia. May the Holy Spirit, we beseech Thee, O Lord, renew our minds with the divine sacrament, for He is the remission of all sins. Through the same Lord Jesus Christ, Thy Son, Who liveth and reigneth with Thee in the unity of the Holy Ghost, one God For ever and ever.